I used to be a school teacher. Obviously, such a gig comes with a beautiful handwriting requirement. (Well, it did, pre-smart board era.) Actually, I always had a nice handwriting. "In college, I sold notes to other students. My handwriting was perfect." "Then I went to law school." "At least it's not dr. (sic) scribble." Penmanship actually matters more in your planner than handwriting. Seriously. Handwriting is just about your style. Penmanship is about readability. My husband has atrocious handwriting. But he prints, and it is neat and easy to read. 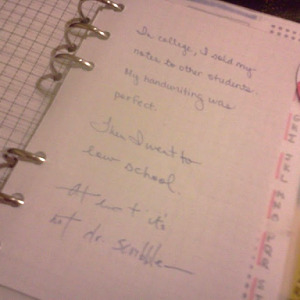 In my planner, I try to be aware of penmanship. I might use all caps for emphasis or print. I might be very fancy or very simple. But I make sure the words are readable. Every now and then, in a rush, I scribble something thoughtlessly. It NEVER turns out well. Call Jean? John? Jen? Jon? Josh? Jobs? Jinks? SEE?!? Never turns out well. Take your time and write something that you can read in your planner or there is no point in writing it down. Practice. Slow down. Think about what you are writing and how you write it. I've found that in the heat of the moment I'm likely to think it's legible though, because of course I've just written it so I know what it says. This is not the same thing as coming back to it a week later and still being able to read it. So now I ask myself, "could mum read this?" She hates my handwriting and can never read it unless I'm really careful about how I form the letters. But that's okay because the feeling's mutual! She learned copperplate *mumble* decades ago and it's deteriorated since, so it's completely illegible to me! I had to laugh at this one. I have good penmanship and handwriting - always have. 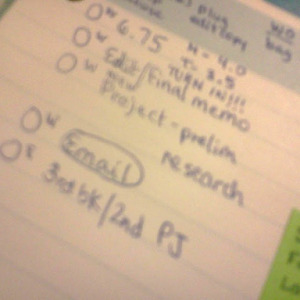 But a couple of weeks ago I ran across something in my planner that I couldn't read. I tried and tried and tried and never could figure it out. Kind of embarrassing for the girl with good handwriting.